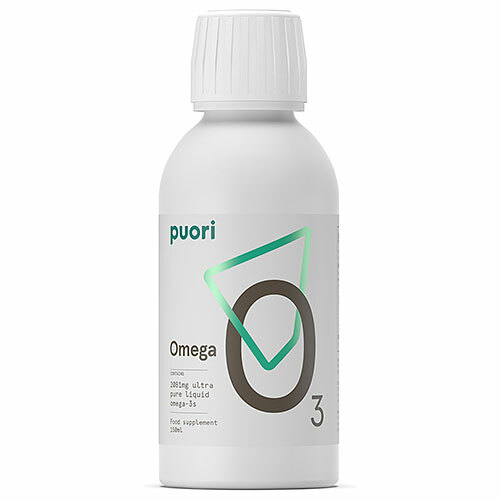 Puori O3 contains ultra pure and highly concentrated liquid fish oil. Mixed with MCT oil from coconut and antioxidants from rosemary for stability to avoid any fishy taste or odour. Omega-3s help your body maintain normal heart function as well as normal brain function and vision. Puori Liquid O3 can help support a healthy body. Fish oil concentrate (anchovy oil), vegetable oil (MCT medium chain triglycerides from coconut), flavourings (natural lemon flavour, natural orange flavour), antioxidants (Tocopherol-rich extract, extract of rosemary). For adults and children 3 years and up: Take 1 tsp (5ml) daily, preferably with a meal or as recommended by a physician. After opening, store in the fridge and consume within 2 months. Consult a doctor before use during pregnancy or for children under 1 years of age. Below are reviews of Puori O3 - Ultra Pure Fish Oil - 150ml by bodykind customers. If you have tried this product we'd love to hear what you think so please leave a review.